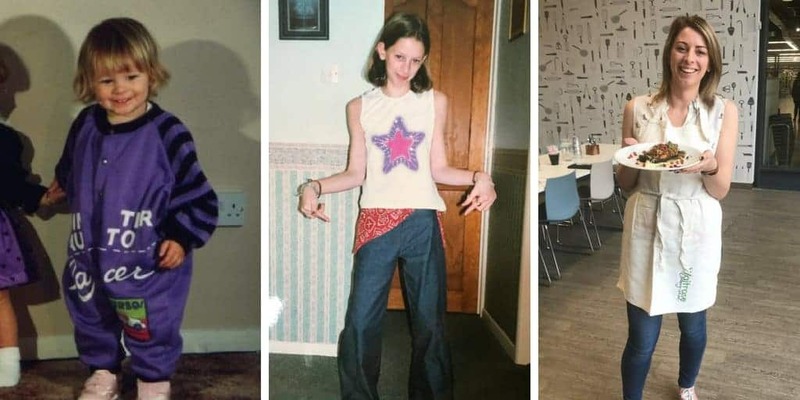 This post is sponsored by Co-op Food. I often work my way around the supermarkets to see what hidden gems I can discover in the free from aisle, but I think I’ve discovered something very special in Co-op Food. 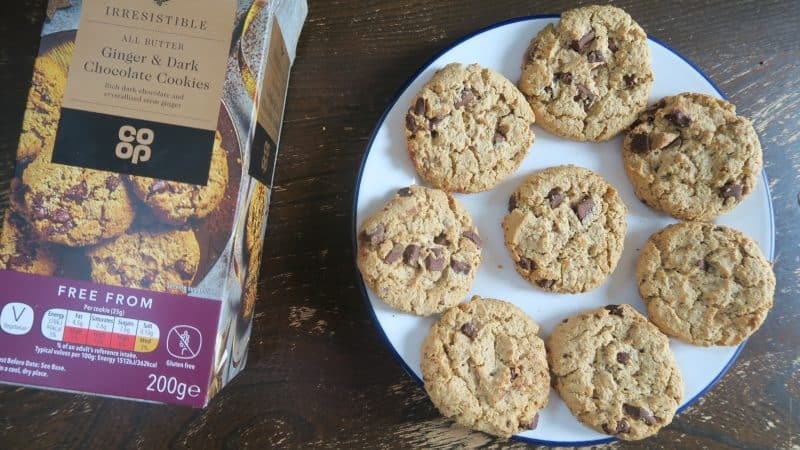 Full disclaimer: I don’t usually like writing reviews as a sponsored post, because it somehow feels it can come across as false, but these products are genuinely so amazing I had to shout about them. 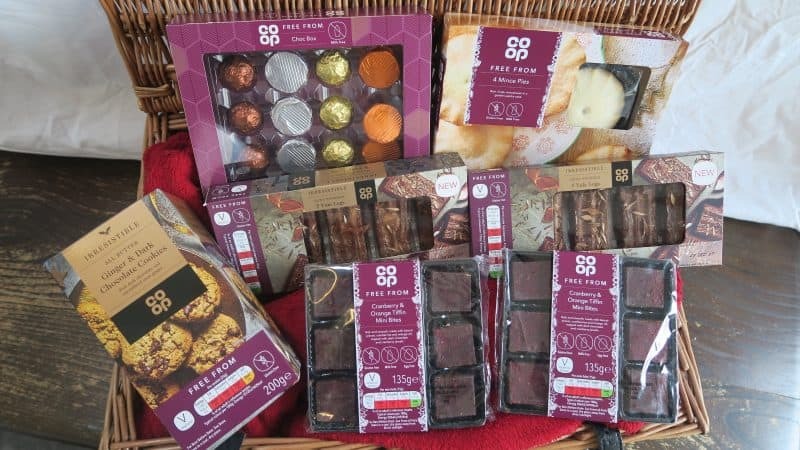 Because there’s something about this free from Christmas range from Co-Op Food that feels a bit special. The packaging looks classy, and the extra touches of gold sparkle and detail in the products just puts them on a whole other level to some of the other free from goodies out there. 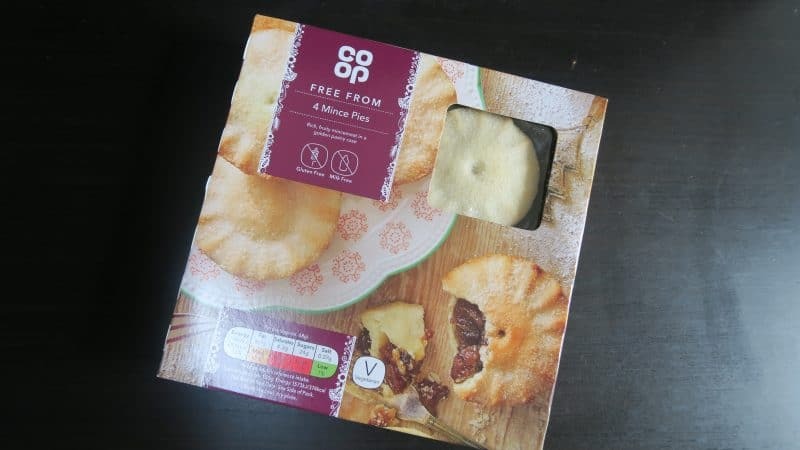 So it’s no wonder they recently won the prize for best free from mince pies for the Co-op Free From Mince Pies, and best free from dessert for the Co-op irresistible hand finished yule log in the Olive Magazine Christmas Supermarket Awards. 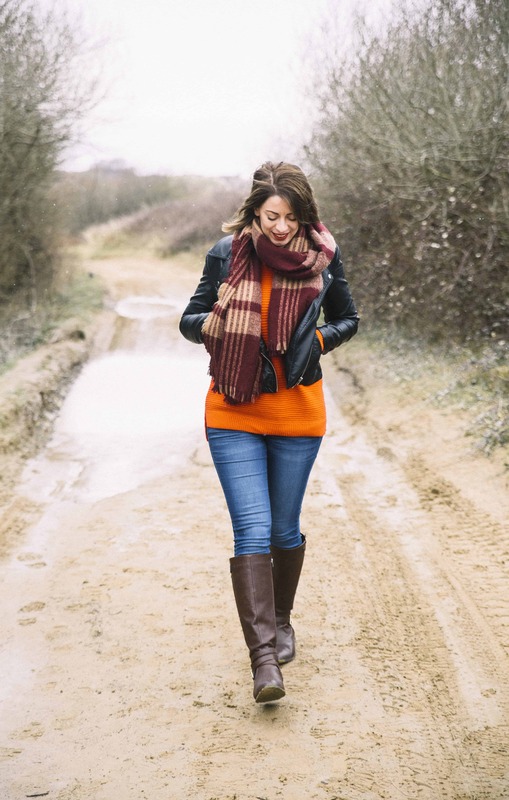 The whole range is just gorgeous and I can’t wait to show it to you – here are my favourite Co-op free from Christmas goodies. 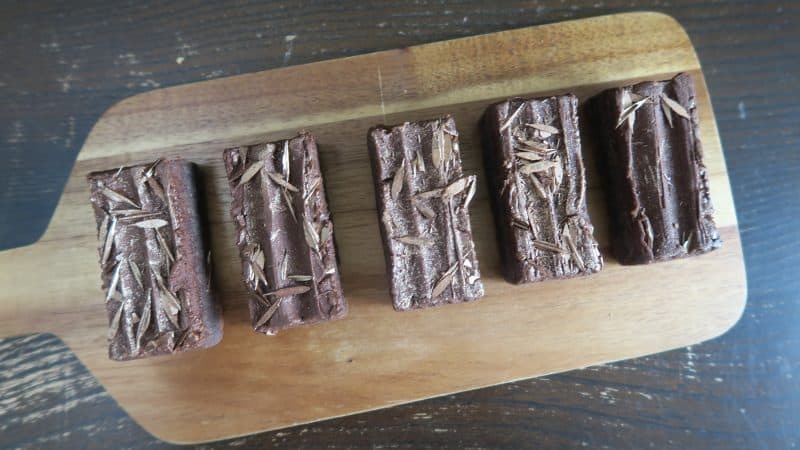 There’s no other word to describe them – these gluten free yule logs are quite simply stunning. New this year, they are gluten free and vegetarian, and have a delicious rich and chocolatey taste. I absolutely adore the gold flakes and sparkles on them, and think they would take pride of place at any gluten free Christmas party spread. 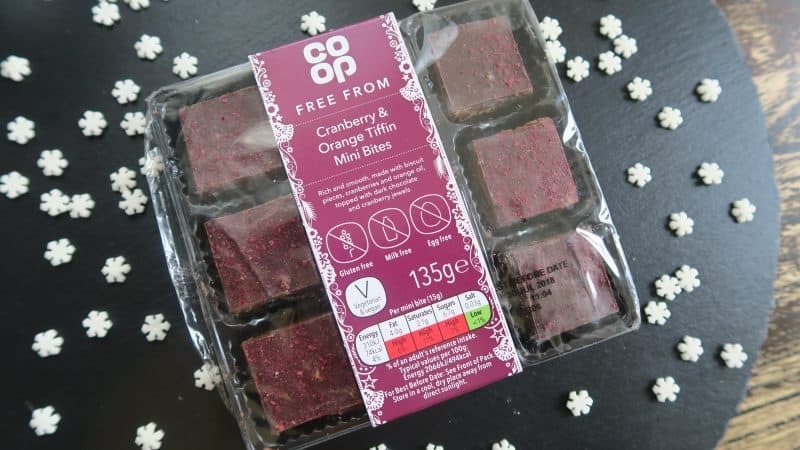 These Co-op cranberry and orange tiffin bites are another great example of the attention to detail this range has. They are gluten, egg and dairy free, and taste absolutely gorgeous as they are infused with orange oil. I love the chewy cranberries against the crunch of the biscuit pieces, and the ‘cranberry jewels’ sprinkled on top make them look extra special. Again, these are another product which would look fantastic in a party food spread. Gluten free mince pies topped with a sugar sprinkle are my absolute favourites. I love the way it adds that sweet crunch when you bite into them. 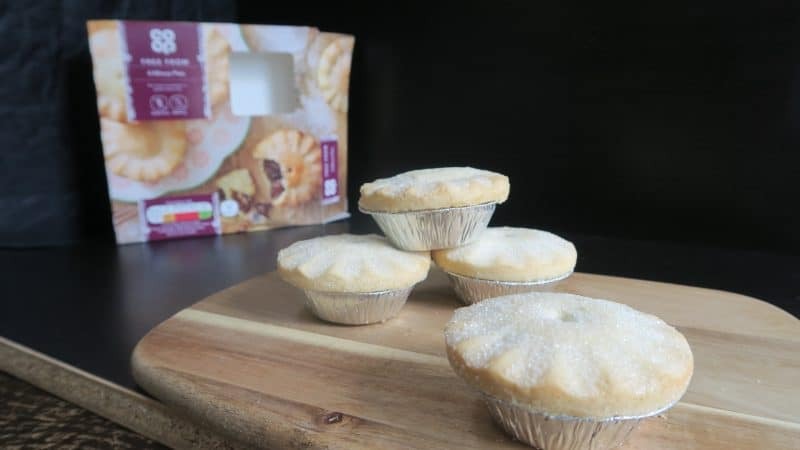 These award-winning mince pies are filled with rich and fruity mincemeat, and the pastry is buttery and an absolute delight. These would be perfect to leave out for Father Christmas – if you can resist eating them before then! Imagine wrapping yourself in a fleecy blanket, big wooly socks on, a hot chocolate in one hand these in the other – bliss! 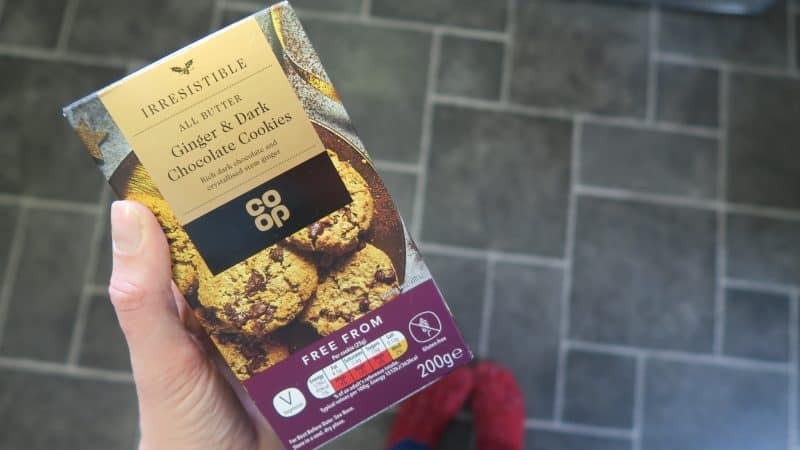 My idea of a perfect Christmas evening would be curling up on the sofa with a box of these Co-op free from ginger and dark chocolate cookies. I love ginger anyway but pair it with dark chocolate and you’ve basically created heaven! 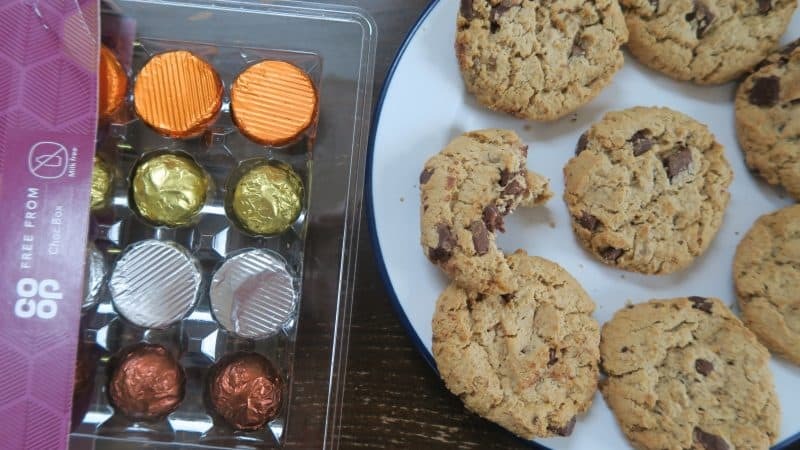 These are crumbly and delicious and have huge chunks of chocolate in them – a real treat! 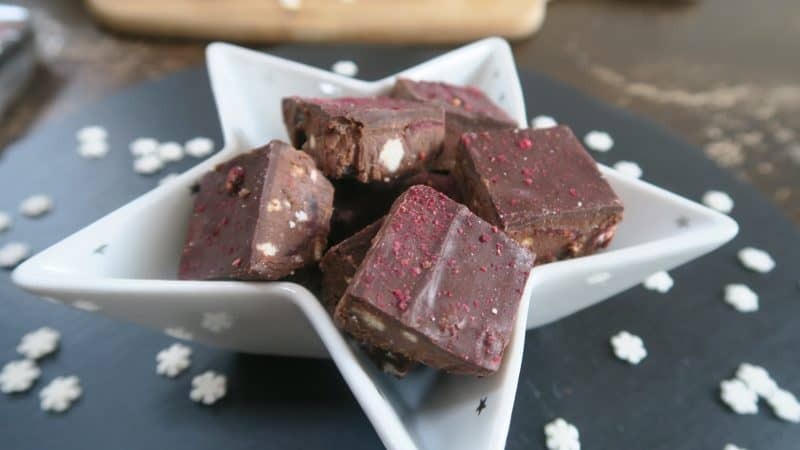 If you’re gluten and dairy free it can be hard to find chocolates which are nice enough to give as a festive gift. 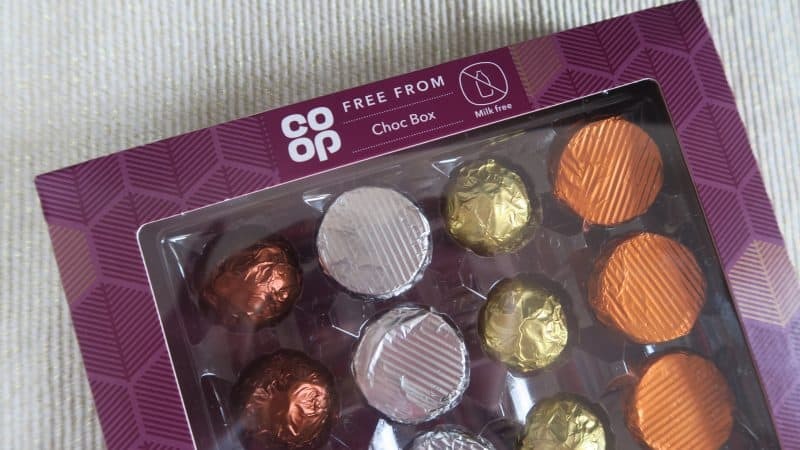 I really love these dairy free chocolates because they look a bit posh! 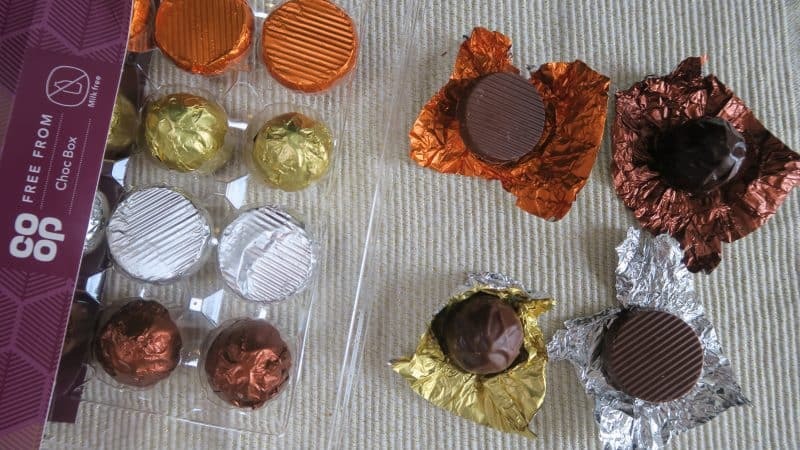 They’re special enough to be able to give as a gift, without looking like some sort of medical-grade food, like I find a lot of dairy free chocolates can do. I loved the variety of fillings too – the salted caramel ones were my favourite, and did not last very long at all! How can I stock up? The free from Christmas range is available across Co-op stores nationwide, just check out the free from aisle! They also have loads of other great gluten free buys – did you know their entire soup range is now gluten free as standard? 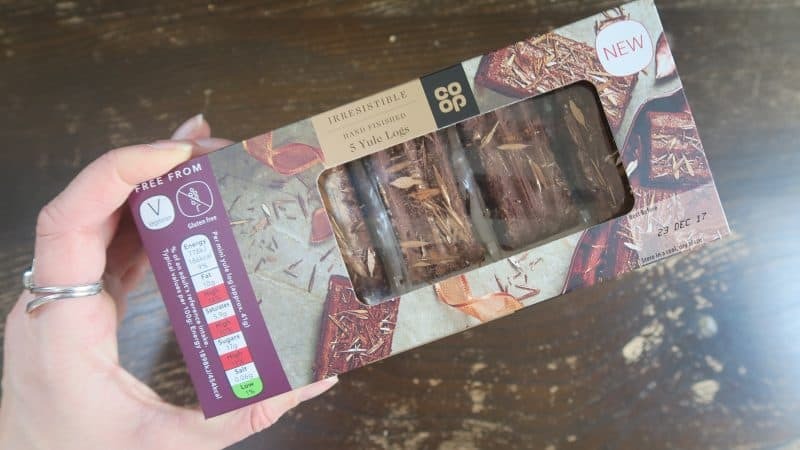 And I’ve seen some posts going round about gluten free Christmas wraps in their food on-the-go section too, so it’s worth a trip to check it out! 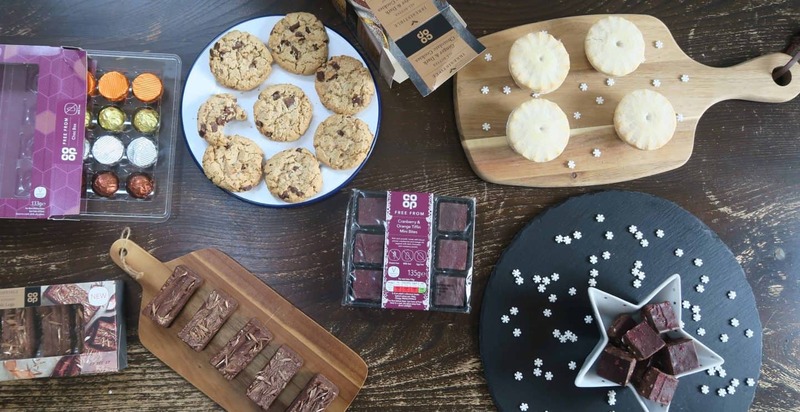 To find out more about Co-op Food’s Christmas range and to find a store near you, visit their website here. his post has been sponsored by Co-op Food. I sometimes accept sponsored posts with brands I love and trust, but my opinions are always my own. Previous Post New gluten free Christmas menu at Côte Brasserie and WIN a £50 voucher!